Lots of useful information over at the Precision Nutrition web, I recommend reading more of what they say! So, Jørgen, tell us about your research in cold water swimming? The research project we did at ÖtillÖ Utö this year was to measure the core body temperature of athletes whilst they were racing. We did that by having the athletes swallow a pill containing a temperature sensor. During the race the pill collected the athlete’s core body temperature every 2 minutes and stored it in the pill. After the race, we read out the temperature data from the pill by holding a small device close to the athlete (The data is transmitted wirelessly). This enables us to see the temperature of an athlete across the duration of the race. Sounds very Star Trek. Why’s this of interest to researchers? Well, there’s not much knowledge of what’s happening to body temperature when athletes are racing. 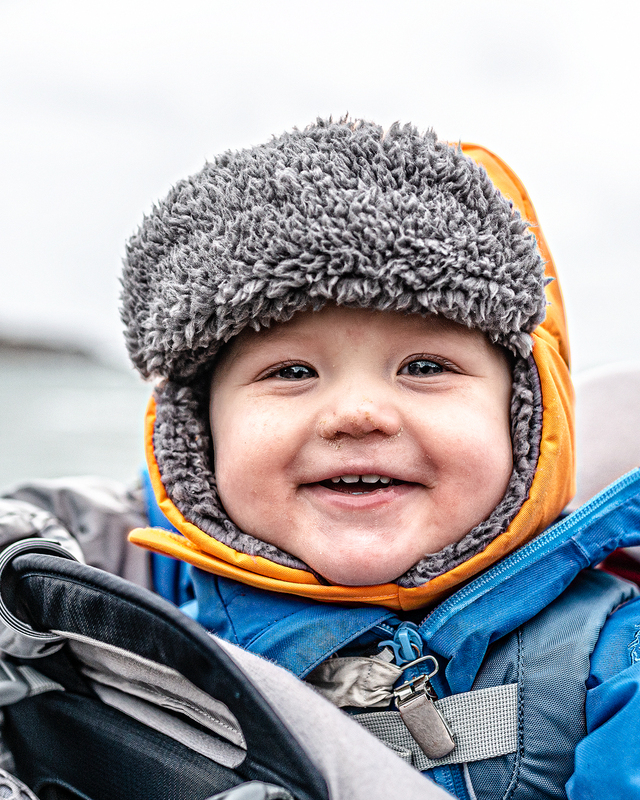 For us, it’s of special interest to see what’s happening with the temperature when you’re out of the water. We know that the temperature is lowered slightly whilst in cold water. What we know from emergency medicine and rescue is that the core body temperature gets lower even when you’re out of the cold water. For about 30–45 minutes after you exit the water, your temperature gets lower, before it starts to raise again to normal levels. This is called the ‘afterdrop’ effect. So, we’re especially interested in swimrun because the athletes are in and out of the water several times. And we are very curious to see what we will find once we’ve analysed all of the data from Utö. How did you get interested in this in the first place? It really was a coincidence from the start! 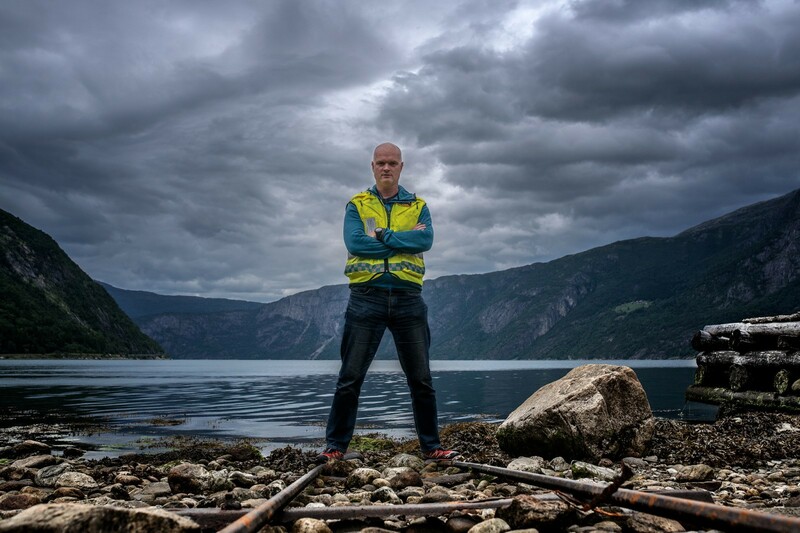 Myself and supervisor Jonny Hisdal have been the Safety Directors of the Norseman Xtreme Triathlon for 12 years now. That’s another race famous for its cold swim! In 2015, we measured a water temperature of 10C the day before the race and we really didn’t know if that would be safe for the athletes. Jonny and I did a test swim on the course, measuring our core temperature with temperature pills. We decided to shorten the swim as a result. Jonny has been a scientist for several years and I had worked in the air ambulance service. He said, “Jørgen, you should start a PhD and do some real research on this”. And so it all started. I’m now doing research for my PhD at the University of Oslo and Vestfold Hospital Trust. Cool, the Norseman is widely considered to be one of the toughest triathlons in the world. What are the main things you have to consider as safety director? At Norseman we have two main focuses for our safety work. First is to prevent accidents and incidents from ever happening. We put a lot of effort info this. We have a very competent crew that do a great work when organizing the event every year. There are some challenges in Norseman on issues other than water temperature. For example, the roads in the area are not all very good out on the course. The race is also pretty remote, with a long way to hospitals, ambulance and rescue services. Secondly, we need to be able to handle any incidents that do happen. To be able to handle accidents and other medical issues, we have a huge crew of medical professionals and volunteers. The Red Cross is present during the whole race, with a total crew of about 35–40 people. Then we also have doctors, nurses and paramedics following the race closely. They’re experienced in emergency and sports medicine. For me it’s important that the medical crew at Norseman can handle being outdoors in remote areas so that we can be sure that the athletes get the best possible care if anything happens. Do you have research interests other than cold water swimming? Yes, we do. We’ve done various projects in the past. We’ve had athletes swimming with a wetsuit in a controlled environment with 10C water, just to see how the body reacts to that. We did all kind of physiological measurements before, during and after the swim, such as looking at the effect on the heart and lungs, temperature, the effect of body fat and muscles on core temperature etc. Then last year at Norseman we drew blood samples from lots of the athletes before the race, at the finish line and the day after the event. We were looking for specific changes in biomarkers on the heart and hydration levels. We also did a lung function test. We’ve also been testing Olympic athletes in the qualifying phase of the Tokyo Olympics. There’s going to be a huge challenge with heat and humidity in Tokyo, so the Norwegian Olympic Training centre put on a training camp for their athletes where we did some testing. On the first day they trained in normal conditions and then on the second day they trained in “Tokyo” conditions. We had the athletes do standardised tests in a room heated to 35C and high humidity and then we did all kinds of physiological tests on them to see if there were any differences across a range of markers. We’re publishing all of these articles and we’ll be sure to share our findings with the Precision Hydration community when we’re finished. What’s your own experience with hydration and racing? Do you race yourself? Hydration is a huge challenge. The latest trends seems to be saying that athletes should train and race with a low hydration status. As a health care professional I know of the dangerous situations that can arise from this. There’s lots of research out there and I really encourage athletes to follow the best researched guidelines such as those preached by PH. And, yes, I’ve done a few races myself, some of them in hot weather. I’ve raced Ironman Nice 3 times and Ironman Cozumel twice. Of course, I used electrolyte tablets diluted in my water during the races to hydrate properly. What might your research mean for athletes looking to improve their performance? First and foremost, we think this can have a real impact on safety for athletes racing in extreme conditions like at ÖtillÖ and Norseman. That’s the most important thing for us, our main goal is to help organisers make their races as safe as possible. Secondly, we think that temperature regulation, hydration, and other physiological factors influencing athletes’ bodies are very important for athletes of all levels. 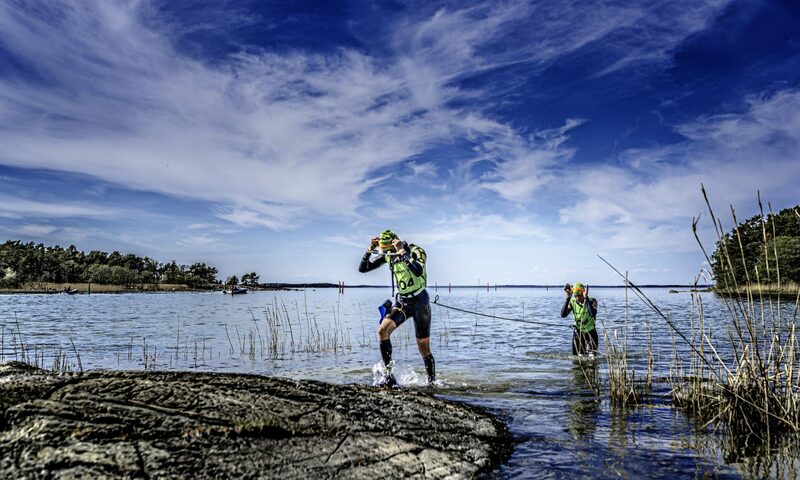 Triathlon and Swimrun are such specialised sports that there’s a major need for research with focus on the specific challenges posed in those races. There’s a lot of things we don’t know yet. We hope to be able to help athletes prepare better for competitions in both hot and cold weather. Herman is my boy. 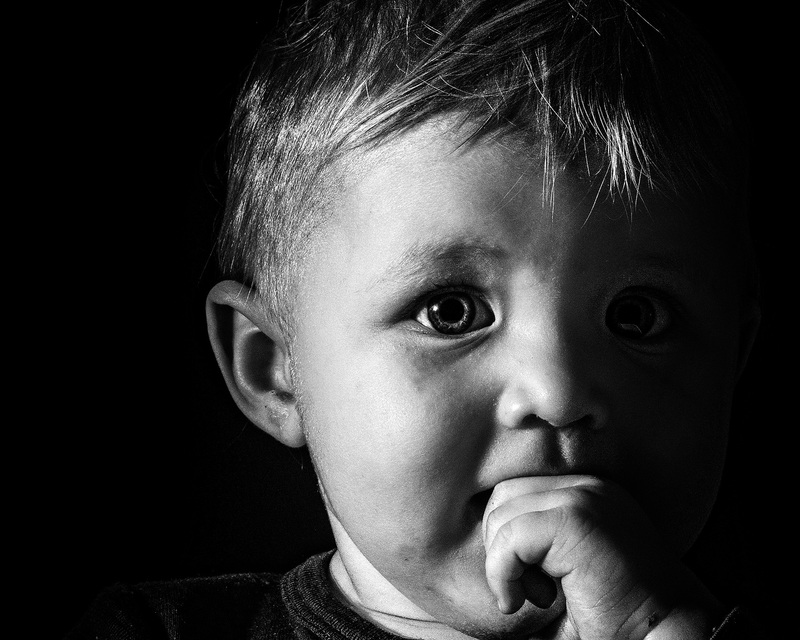 He is a year old now – and we had to celebrate with a photo shoot. As most triathletes are familiar with, there is a yearly Bike Count at the Ironman World Championships at Hawaii. What they do not have, is a Wetsuit Count. 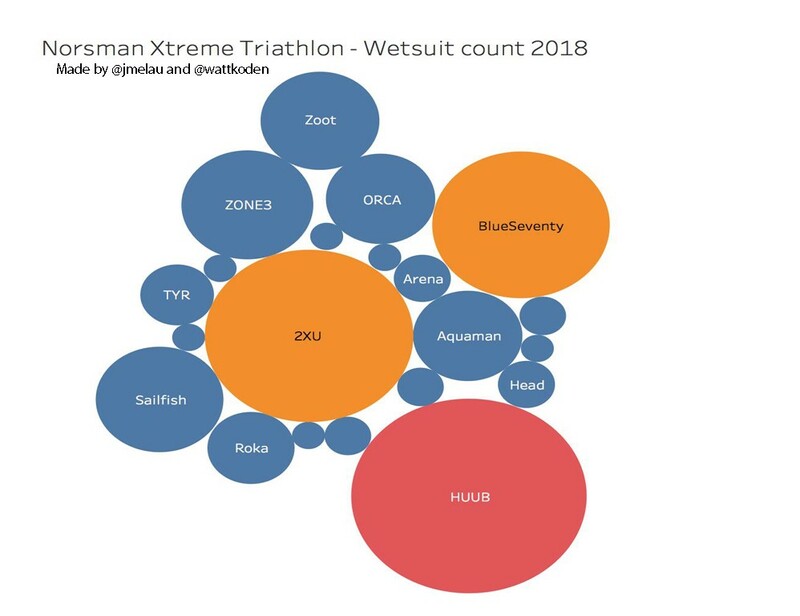 So, since we already were occupied with a research project this year, we thought it would be a good idea to perform a wetsuit count at Norseman. For those of you that do not know, each year there is a Bike Count at Kona, performed by Lava Magazine. And not only are the bikes being registered, they also count the wheels, power meters, hydration systems, helmets, pedals and more. But no wetsuits, since Ironman Hawaii is a non-wetsuit race. At Norseman however, wetsuits are mandatory. As waters in Eidfjord are notorious for being cold. As a matter of fact, this is the reason why I started my PhD a few years ago. 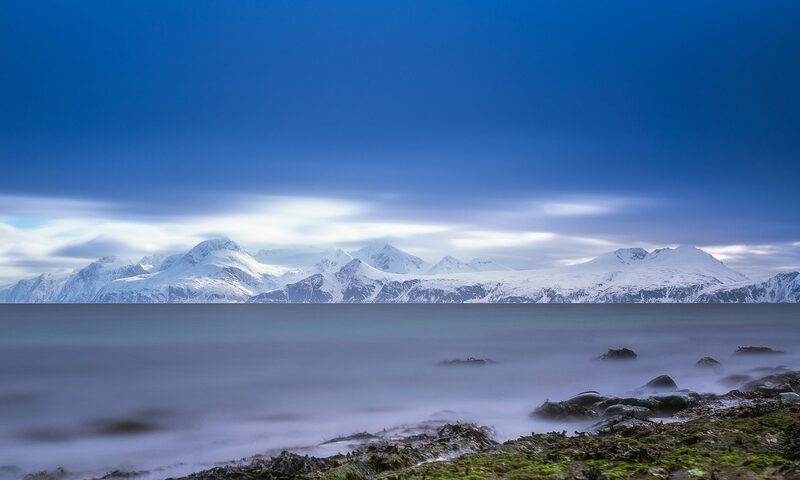 In 2015 the water was 10°C cold. And since I have been the Medical- and Safety director for the race since 2005, we had to shorten the swim at the race that year. After the race, I decided to start doing some research to find out how the body is affected by swimming in 10°C cold water. And my PhD journey started. All athletes had to board the ferry at Norseman in the middle of the night. They are all being counted while going through a small ship hatch to get onboard. I stood right inside the hatch, looked at everyone’s wetsuit. The tension among the athletes are electric and slightly nervous. I hope that for a few, seeing the medical director onboard, eased the tension a bit. So on to the results. 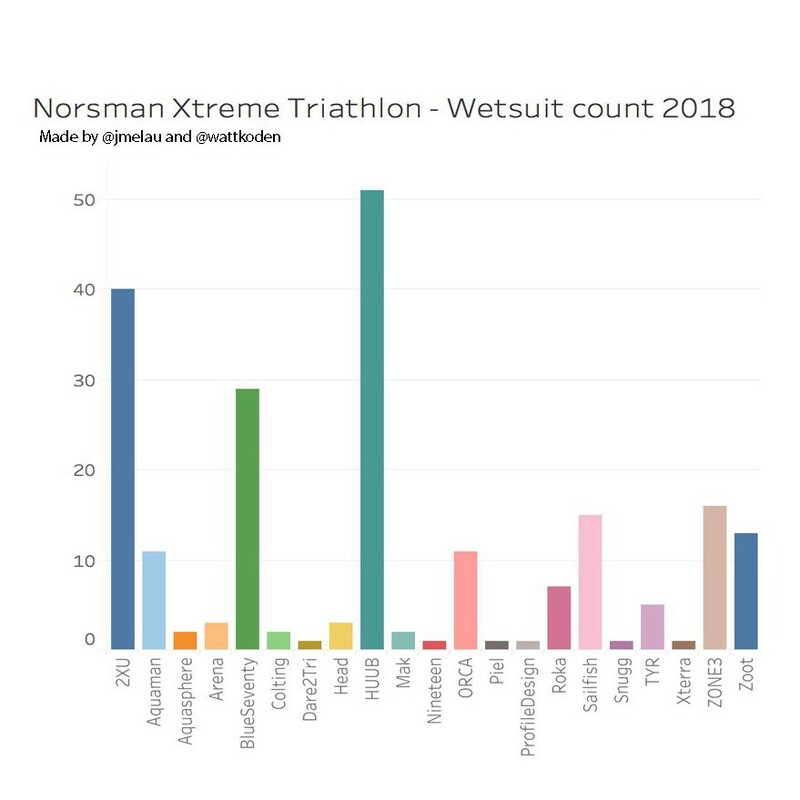 As you can see, there are three major wetsuit brands among Norseman athletes this year. Huub, 2XU and BlueSeventy, with Huub in the lead. This might not be a surprise, as Huub sponsor a lot of Norwegian and international athletes. They also have made a lot of effort on research to make their products as good as possible. I am not sponsored in any way by Huub, or any other wetsuit brand. In the future, we might be able to work on our research project together with the makers of wetsuits. We have some approaches to how to make swimming in cold water better and safer for the athletes. Later we will reveal our Bike Count, done by my research friend Martin. Stay tuned!